Officially, HR.BLR.com is BLR's "Everything-HR-in-one-place" subscription web site. But it really is 30 years of BLR solutions to daily HR needs and problems, available at a click. It’s an amazing program you have to try to believe. Federal employment law is well-publicized. Not so that of most states … except on HR. BLR.com. Pick any of 200+ topics, alphabetically arranged, from ADA to Workers’ Compensation, and we’ll show you a plain-English summary of federal and your state law, side-by-side on the same screen. Differences and conflicts leap out! And you rest easier knowing both bases are covered. HR.BLR.com has pre-written thousands of job descriptions for you, from clerk right up to company president. They’re legally-reviewed, non-discriminatory, ADA-compliant, and come with suggested grade and salary level for your state. Edit or just use as is. 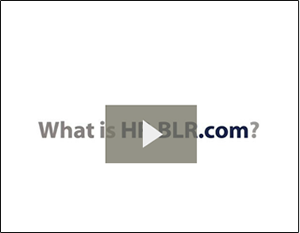 HR.BLR.com includes detailed Audio Training presentations and more than 100 PowerPointR® presentations on key HR topics, from FLSA, FMLA and ADA to managing non-English speaking employees. Slides, speaker notes, quizzes, take-aways ... they’re all there and all done. Your managers will think you’re a born trainer. HR.BLR.com’s new Newsletter Wizard help you will research, compile, write and format a custom newsletter for employees as fast as you can click a mouse. The only thing it won’t do for a budding HR journalist is give you a press card … yet. When an HR question comes up in a management meeting, they need an answer NOW. With HR.BLR.com, you’ve got it. The site compiles news (updated daily), white papers, a whole library of answered questions just begging to be accessed. And a super-quick system of accessing them. You've got them if you've got HR.BLR.com. That plus hundreds of other forms, checklists, calculators, and other great tools it would take a whole day to find, if you could find them. You’ve got better things to do with that day. HR.BLR.com lets you do them. My.HR.BLR.com and My Documents is the web site’s personal storage locker for all you need to save. If your research, key links, commonly needed documents, etc. need organization (and whose don't! ), you’ve got it in HR.BLR.com. Save even more of your valuable time when you use the new Bookmarking feature, which allows you to save bookmarks to pages you use frequently for instant access later. Even write digital notes on your screen with our Notes feature while you are working, attached to your favorite pages or documents. Print your notes and organize them in your personal folders for quick access later. Only you know. But you also know that the best way to see that HR.BLR.com meets that need is to try it for 14 days, FREE. Decide to own it, and the cost is about what you’d spend on two cups of coffee a working day. Your satisfaction is guaranteed. Don’t go another day without HR.BLR.com. Try it for 14 days, FREE!